Foxconn, the world's largest contract electronics manufacturer, has become the latest company to back Mozilla's Firefox OS and is developing more than five devices running the mobile operating system for its customers. Foxconn, best known as the maker of Apple's iPhone, also assembles PCs, TVs and handsets for many other top vendors including Nokia, Sony and Hewlett-Packard, according to analysts. Through the partnership with Mozilla, the company wants to provide reference models for new products built using the fledgling Firefox OS. Covered devices could include smartphones, tablets, laptops, and TVs, said Young Liu, general manager for Foxconn's innovation digital system business group. "We are not coming out with our own brand," he stressed. Instead, the company wants to help technology vendors transition to the post-PC era, at a time when the industry is straying away from Windows and Intel-based chips. Now many PC vendors are focusing on mobile devices, and releasing tablets and smartphones to drive sales. "It can't just be like in the past, where we used hardware to compete. You have to compete on the entire user experience," he said. "We hope with Firefox we can create an ecosystem in order to help our past PC customers improve their competitive edge." The Firefox OS is based on the HTML5 web standard and is meant to compete against Google's Android OS and Apple's iOS, both of which are now dominating the mobile devices market. 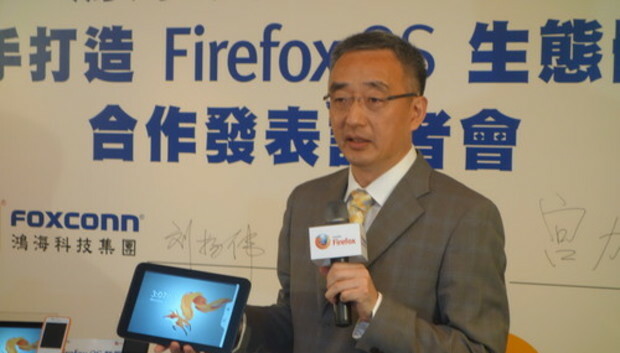 Mozilla expects the partnership with Foxconn will help pave the way for more Firefox OS devices from other branded vendors, said Li Gong, Mozilla's senior vice president for mobile devices. "They [Foxconn] are going to bring not just smartphone, but a number of other devices, and that's another big addition to the Firefox ecosystem," he said.